Set aside your Sunday afternoon—here's what you'll be doing. The other day, TV writer Jane Espenson broke the internet by posting her Pringle Ringle—an adhesive-free feat of engineering made entirely from Pringles. "I did it! I did it! I built a Pringles ringle! No glue, just physics." Over the next few days, she was retweeted 84,000 times (at time of publication) and her tweet was favorited by 150,000 people. If you want to build a Pringle Ringle of your very own, it's not quite as complex as it may seem. The DIY food-loop has been floating around social media and YouTube for years—and there are plenty of step-by-step videos that show you how to achieve a ringle of your own. But back to the Pringle Ringle. After you've built a thin Pringle Ringle, there's no reason to stop. Vlogger Emrah has created a multi-layered Pringle Ringle—the mille feuille of ringles, if you will. There aren't many other brands of potato chip that can boast such a rich and varied library of life hacks. That said, we have plenty of ways to make chips interesting. 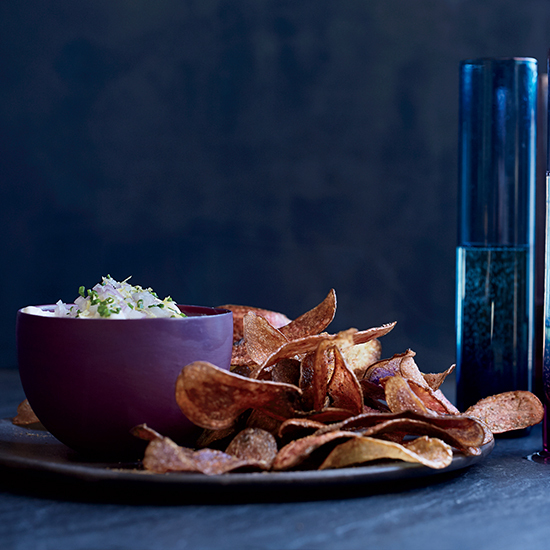 Check out our recipe for potato chips with nori salt, herbed potato chips, and DIY Idaho potato chips.